Water damage often hides in hard-to-reach places in the home. When allowed to accumulate behind installations such as bathroom cabinets, it often leads to further structural and property damage that is difficult to fix without professional assistance. 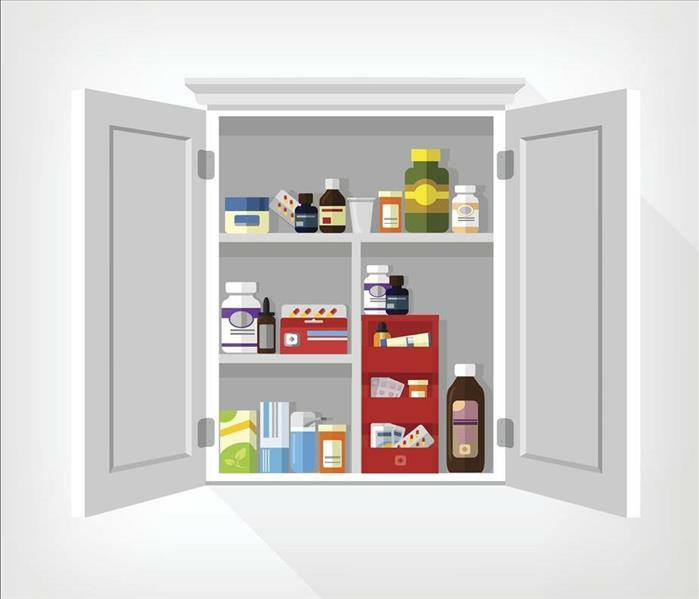 In the event of a leak behind a bathroom medicine cabinet that leads to water damage in your Durham rental home, certified, highly-trained SERVPRO technicians are available 24/7 to address and mitigate the damage. When our team comes to your home to inspect your water damage, sensors are used to evaluate moisture levels. After inspection, water is removed from the bathroom wall with a portable extractors or drilling weep holes for drainage and drying depending on the amount of space available. After extraction, our SERVPRO professionals can get right to work on drying the water-damaged areas behind your bathroom cabinet. To facilitate proper air flow, a technician can now use those drilled weep holes to force in warm air via an injecti-dry system, part of our advanced equipment invenory. After that, an air mover is positioned at a 45-degree angle to the affected wall at a rate of one per 150-300 square feet of drying area. In cases where surfaces such as carpet are soaked through, technicians position air movers every 50 to 60 square feet of affected area. Typically, carpets are not the flooring of choice in a bathroom. Dehumidifiers also require proper setup to absorb and eliminate moisture picked up by air movers. This process is aided by small chambers created with polyethylene partitions that are positioned to contain drying to the water-damaged area. As the surface dries, the partition is made smaller in order to continually accelerate drying. After drying is complete, our experts can then clean the area with an EPA-registered broad spectrum disinfectant. Fast drying techniques can aid in the cleanup process as well. In the event of odors, ULV foggers or pump sprayers are commonly used to deodorize walls and ceilings. For a minor mishap, a gel to absorb odors and provide fresh scents can be used. 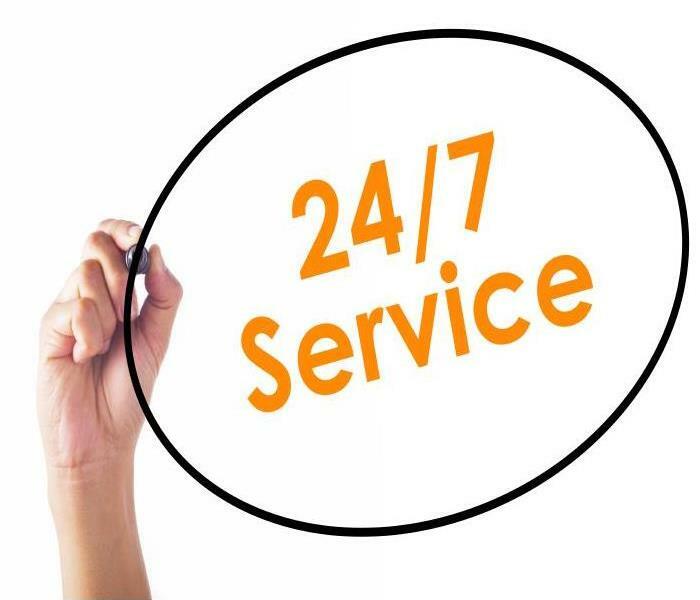 SERVPRO of Durham is ready to assist you 24/7. If you need assistance with a disaster of any size, call us today at (603) 868-3343. Here is a great place for Higher Education. Timing is vital to avoid further issues, so do not hesitate to call us at (603) 868-3343 when you need to, even in the middle of the night. Laundry rooms in Durham homes are a common place for fires to begin. To keep your home safe, it is essential that you practice some safety precautions in your laundry room. The combination of electricity, water, natural gas, heat, and combustible materials can lead to a fire hazard which is potentially dangerous every time you do a load of laundry. Laundry room fires can be small or catastrophic, but routine checkups and simple maintenance can help prevent these disasters. When you’ve experienced a laundry room fire and fire damage in your Durham home, get in touch with our SERVPRO staff right away. We are a professional remediation company who is trained and experienced to handle situations like this. We need to move quickly to avoid additional damage from settled smoke and soot, so reach out to us as soon as the flames are extinguished, any time of day or night. To help prevent a fire, clean your lint filters out after every use. If you use a dryer bar or dryer sheets, residues can accumulate on the lint screen. Remove the screen each month and clean it with soapy, hot water. Let your lint filter air dry before putting it back into the dryer. You should also properly dispose of the lint. Don’t leave an accumulation of lint in the laundry room, and don’t leave any combustible liquids near your washer and dryer. Even a small fire can produce much smoke. Besides cleaning the settled smoke from affected surfaces, SERVPRO staff also needs to clean the air. To do so, we use machines such as ozone generators and air scrubbers. The portable ozone machines generate ozone, which reacts chemically with molecules that cause odor and oxidizes the residues and removes the odors. Air scrubbers can remove airborne particles of smoke and odors from the air in your laundry room, pulling them through a series of filters, and then exhausting clean air back out into the area. If you are using a flexible, dryer vent hose, get a rigid plastic or metal dryer hose vent to replace it with right away. The flexible hoses are lint traps and a huge fire hazard. The rigid ones still need to be cleaned regularly but are much safer. You should also ensure that both machines are plugged in the appropriate wattage outlets which are grounded. Do not ever use an extension cord to run either machine and do not overload the outlets they are using. Never leave your dryer running while you are not home or when you go to bed. SERVPRO of Durham wants to help you clean up after a fire in your home in Epping, Stratham, or Kingston. Timing is vital to avoid further issues, so do not hesitate to call us at (603) 868-3343 when you need to, even in the middle of the night. Water damage can be devastating to a structure if it is not addressed as soon as possible after the initial water intrusion. 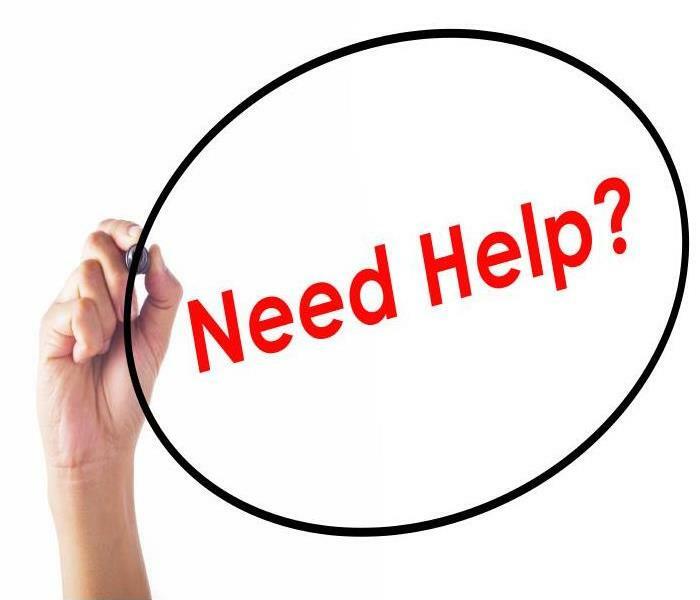 Whether it is from a water line failure, broken dishwasher in a unit or other reason, you should seek help now or at least within 48 hours; any standing water needs to be handled as a hazardous black water situation if it is left to stagnate. When you contact SERVPRO for commercial water removal in your Newmarket apartment complex, our local emergency response team arrives on site within hours to begin cleanup. Since drywall can absorb water, units that could potentially be affected by water are inspected. We do not rely solely on visual assessment to determine if building materials are compromised by moisture. We use digital probes that measure moisture behind walls and subflooring, so there are no hidden odor or mold issues when surfaces appear dry. The health and well being of your tenants is our priority. Depending on the amount of standing water in the property, our technicians have various methods to extract water from the unit or units quickly. If it is a clean water spill, a weighted extractor pushes excess water from carpet padding, and we can direct airflow under carpeting to thoroughly dry subflooring and padding from the bottom up with the use of air movers and dehumidifiers in tandem. Drywall is absorbent and pulls water up. If drywall between apartment units is affected, complete drying is crucial for the removal of moisture or structural damage and mold can be secondary damages that occur. If the drywall or building materials are found to be saturated, SERVPRO technicians drill weep holes to drain water and carefully set up air movers to direct air behind drywall to ensure there is not an ideal place for mold colonies to set up home which can happen as quickly as 24-48 hours after a water spill. At times, we can perform a controlled demolition to remove saturated materials or to inspect wall or floor voids. Contact SERVPRO of Durham at (603) 868-3343 for fast and efficient commercial water removal from your property. Our technicians are available 24/7 and have the equipment to extract water quickly and the expertise to help avoid secondary damage from water through fast action. We're Faster To Any Size Disaster. Here is your local gov't. Microbes exist in extremely high numbers across the planet, including in Durham, and have thrived for eons, regardless of climate. Their minimal requirements and their hardiness make for a durable organism that can easily create hundreds or thousands of dollars in damaged homes. Durham homeowners often believe cleaning mold damage away when found seems easy, especially if done using bleach. Unfortunately, this method fails at preventing regrowth of mold, and worse, it can help mold spread to other parts of your home. The anatomy of a mold is relatively complex for such a tiny organism. The invisible spores travel and spread. When homeowners find mold, they view patches or colonies as the colorful part. The underside is the location of the hyphae, which anchors the mold onto surfaces. The hyphae, like small roots, burrow into the surface. Doing this can create primary mold damage, such as crumbling of drywall and other porous materials. It is also the well-known stain left behind after cleaning with bleach. Cleaning mold with bleach fails because water molecules can penetrate where bleach molecules cannot. The size of bleach molecules prevents penetration into surfaces such as drywall or wood. The surface may seem clean and free of mold, but the hyphae remain. Still alive, the possibility of embedded hyphae to re-emerge later increases because of the water provided to them – the same water mixed with the bleach when 'cleaning' the wall. SERVPRO of Durham can help remove mold damage and prevent microbial growth from returning. Increase the healthy state of your home by calling us at (603) 868-3343 when you find this fungus growing inside your home. Recreation in this city here. Soot and smoke damages require the correct cleaners to remediate. Contact SERVPRO after a fire and our technicians will clean your damaged items. Homeowners facing fire damage risk the further destruction of their Newmarket dwelling’s structure and interiors by attempting clean up on their own. The chemical composition of the soot, smoke, and other debris spread by a fire requires the use of precise techniques and products to restore surfaces and belongings efficiently and safely. Partner with us for the best possible post-fire outcome. Unique cleaning issues that even professional housekeeping companies in the area are not equipped to abate follow fire damage in Newmarket. Specialized training completed by our technicians provides the support needed to prioritize the tasks and to choose the tools and method that lead to the most successful result. We also work with you to identify jobs you can take on to ensure a quicker resolution. The first and most critical responsibility you have as a homeowner is an immediate call to engage SERVPRO’s services. Fire debris is exceptionally corrosive, damaging the structure and contents of your home within minutes. Charring is but one of the concerns. The compounds created when wood and synthetic building materials ignite float unimpeded throughout your home, discoloring and etching plastic, glass, fabrics, paper, painted and varnished surfaces, and metal. The first effects occur within minutes, and permanent damage is observable during the first hours. To prepare for the SERVPRO crews, make pathways across carpeting and cover upholstery with clean sheets or drop cloths. If power is unavailable, you should empty the freezer and the refrigerator and prop doors open. Try not to move around the house to minimize further spread of soot or ash. Turn off the HVAC system and change filters. Blocking vents with cloth can prevent soot from entering the ductwork where it could circulate into other areas. Our well-coordinated crews spread throughout your house following the soot and smoke, many hands making much quicker work of the cleanup than could be completed by a homeowner in the same time. Light, ashy soot vacuums up well, and dry sponges clean other items coated with dry residue. Wetter soot may need a spray and wipe technique, and detailed articles clean up via immersion if waterproof or washable. Fabrics like carpeting and window treatments require professional cleaning, some on site and others at dry cleaning establishments. SERVPRO workers match cleaners and solvents to the type of residue and add abrasives if the coating is particularly tough to remove. At every step, we are in conversations with your insurance carrier to provide evidence for your loss and limit your liability. Under the direction of SERVPRO managers, you may take over some of the cleaning tasks. Knick-knacks, dishes, laundry (after a tutorial), and other smaller items are manageable by homeowners. Removal and disposal of damaged food items and various other tasks may be completed safely by you in consultation with us. Speed and training in specialized techniques are crucial when responding to fire damage. SERVPRO of Durham is available round the clock at (603) 868-3343 to arrange for a damage assessment and to institute a plan to return your home to pre loss condition. We have specialized equipment to help us restore your home from flood damage. We are available 24/7 so don't hesitate and call us right away. If floodwaters have severely damaged your Durham home, the cleanup process and repairs that are needed can seem insurmountable. You have to act fast before the water does more damage. Flood damage to your Durham home requires the help of a professional remediation company such as SERVPRO. 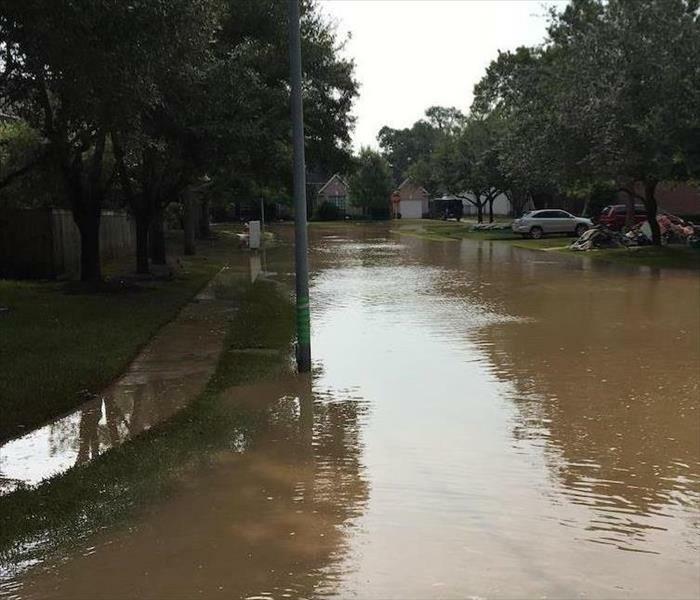 Floodwaters can not only cause a great deal of damage to your home, but they can be dangerous to traverse because of contamination and debris. Let our staff handle the cleanup instead with our training and equipment. Although the situation is overwhelming, you do not want to wait to call us for help – not even for a few days. Once you have determined everyone is safe, including your pets, it is time to start the restoration process. You should take any pictures that you can first before reaching out to your insurance company and before any cleanup happens. Doing so helps to ensure you get the coverage you need. SERVPRO staff checks the extent of the damage after we arrive at your home. We wear protective gear to keep all our workers safe while we deal with the water and get your home back to usual condition. Heavy-duty, truck-mounted pumps help us remove as much standing water as possible. Then, we can proceed with the drying process. We use a variety of specialized equipment to help us remove the rest of the moisture from your home, such as moisture sensors, dehumidifiers, and centrifugal air movers. Devices are monitored daily and moved around the affected areas as needed to ensure we achieve the fastest drying time and avoid other damage such as mold growth. Many times, in a flood damage situation, we remove some of your possessions and furniture to an off-site location for restoration while we restore your home. Everything is returned and put back in place when we finish cleaning your structure. At SERVPRO of Durham, we understand that getting your home in Newmarket, Kingston, or Stratham back to its safe, dry condition is of utmost importance for you and your family. Give us a call right away at (603) 868-3343 as soon as the storms subside, and you and your family are safely out of the home. Celebrating Durham and 150 years of innovation, click here for more details. When Dealing With A Water Damage Disaster In Your Durham Home, Our Crew Is Here To Help! Call us anytime at (603) 868-3343 so we can help you before the problem gets worse. One of the best modern conveniences in your Durham home is your dishwasher. It allows you to use less water, and also makes it, so you no longer need to stand at your sink washing and drying all those dishes and pans. However, when a good dishwasher goes bad, the aftermath of water damage that needs to be cleaned up is not anyone’s idea of a good day. Failed appliances cause thirty percent of water damage in homes, and dishwashers are a significant contributor. Once your dishwasher has malfunctioned and dumped much water onto your kitchen floor, you need water removal services to get your Durham home back to its normal condition, and it is easy to see why SERVPRO is the right choice. As a professional remediation company, we can take care of the issue, clean up the water, and dry your home out in a short time. Conducting regular maintenance such as cleaning rubber seals, flushing out filters, protecting against rust, and unclogging spray nozzles can be done to help prevent issues with your dishwasher. If you don’t do this, the appliance can work less efficiently and even break down, which can result in water leaks. The appropriate hoses should also be installed for your dishwasher model. Opting for stainless steel braided hoses is a good idea, as they tend to fit more easily into spaces that are tight without kinking, which makes other types of hoses susceptible to bursting. Also, make sure to routinely check the water lines which run from your dishwasher to the kitchen sink and the sink drain. Any leaks should be handled immediately. When water is all over your kitchen floor, SERVPRO staff work quickly to remove any standing water first. If the water is more than a few inches, we use truck-mounted pumps to get as much of the water up as we can. We then use drying mats and dehumidifiers to finish drying the affected floor and the air in the room. We want to get this done to prevent additional damage such as mold growth. Only running your dishwasher while you are at home ensures you can quickly tend to a matter of a burst hose if it should happen. You generally have little to no warning of these incidents, and you do not want to be absent when it happens so you can stop the flow of water right away. 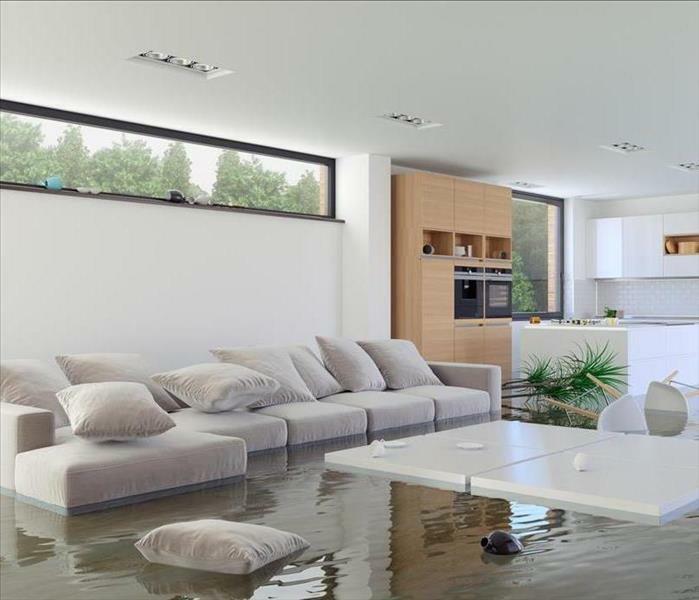 SERVPRO of Durham are experts at dealing with water removal emergencies and returning your home in Newmarket, Epping, or Stratham to its usual condition. Call us anytime at (603) 868-3343 so we can help you before the problem gets worse. Our technicians are available 24/7 for all your home restoration needs. We have the best equipment for any job big or small so call us today. 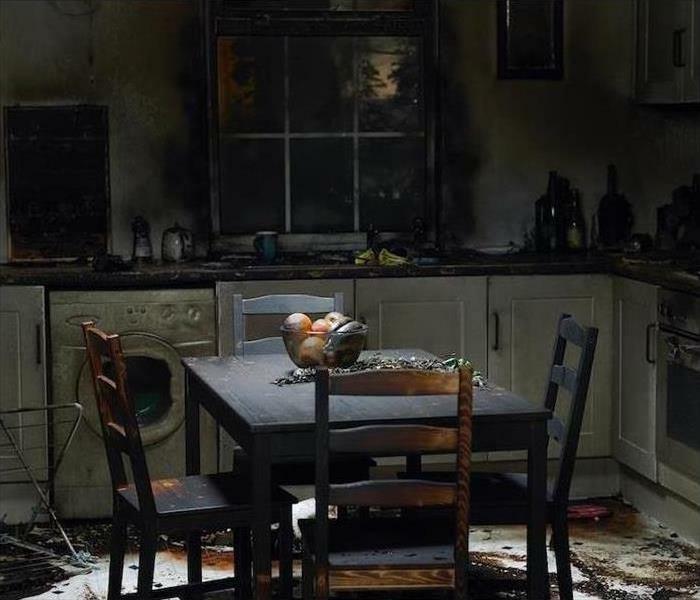 As widespread and damaging as a fire in your Durham home can be, you want to make sure the right steps get taken immediately to preserve and protect as much of your investment in your home and belongings as is possible. While many homeowners often choose to fixate on structural concerns and substantial damages of this nature, compromised materials like upholstery and drapes can often become irreparably damaged without the prompt response from trained professionals. Many Durham homeowners when considering fire damage might not consider their drapery and upholstery to be chief fire damage concerns. These potential restoration needs, along with the more glaring structural concerns and smoke damage, all get assessed with the initial thorough inspection of our SERVPRO rapid response team. This inspection is vital to determine the full scope of the damage and determine the necessary steps to restore a fire damaged property completely. Dry cleaning is part of the restoration and cleaning services that we provide properties throughout our service area both after emergencies and as an ongoing upkeep service. Additionally, we offer steam cleaning to affected fabrics, textiles, and materials contending with smoke and soot residues. 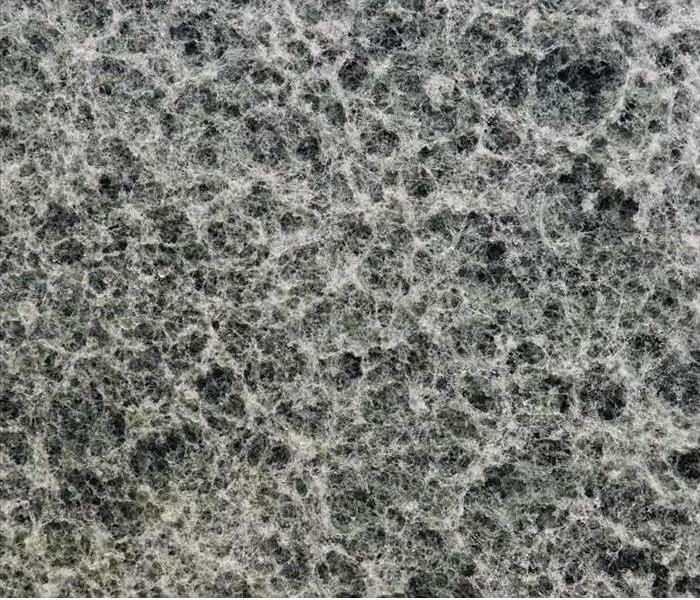 Advanced cleaning techniques like these can help to remove soot residue, staining, and even years of dirt and dust trapped in the fibers of the materials. Cleaning begins with high-powered vacuums to remove recently settled soot and smoke particles from the surface to reduce potential staining. This deep cleaning process is also important to help to reduce overwhelming odors that often accompany widespread house fires. While our effective equipment such as thermal foggers can work to eliminate noxious scents quickly and permanently, cleaning up exposed materials with our dry cleaning equipment can help the efforts of thermal fogging to be more successful. While your upholstery and drapes might not always be the first thing to enter your mind after a fire, they are part of the comprehensive restoration package that our SERVPRO of Durham technicians can offer after disaster strikes. 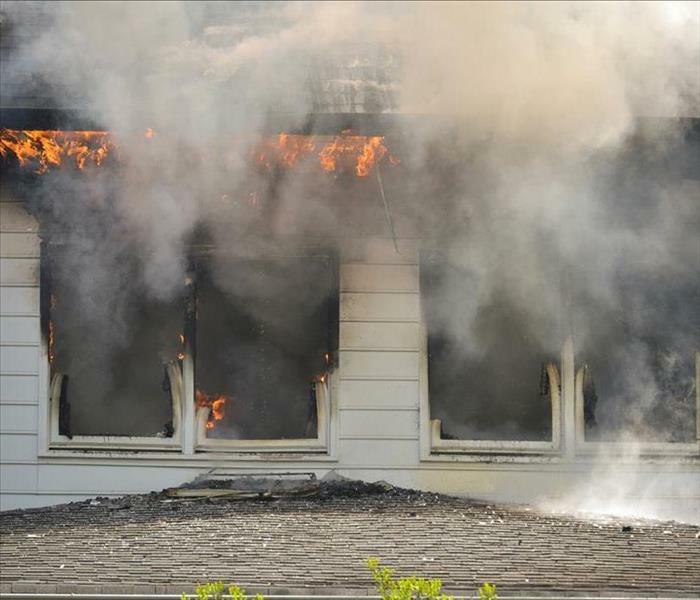 Let us help you make fire damages “Like it never even happened.” by calling (603) 868-3343. Click here for a list of Community Programs & Events. What are Desiccant Dehumidifiers and How are They Used to Remediate Water Damage in Your Kingston Home? 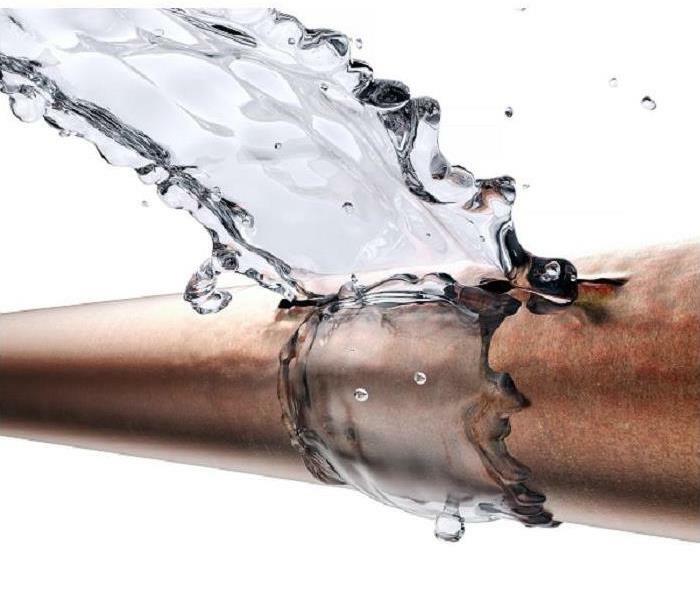 Plumbing failures can cause a lot of water to accumulate in your home quickly. Call SERVPRO of Durham for all of your water loss restoration needs. A failure in your plumbing system is the most common type of water damage situation that occurs. Once a pipe breaks inside your Kingston home, many gallons of water can pour into your structure quickly. Moisture can easily seep into many of the materials that make up your contents and building materials. Once these items get saturated, it is wise to call in a professional restoration company such as the SERVPRO Franchise System to mitigate issues created by the disaster. When materials receive water damage, the ideal conditions must get created for them to dry out rapidly. Whenever moisture gets into your house, mold growth is always a possibility which is why our SERVPRO Franchise professionals always mitigate water damage inside your Kingston residence as quickly as possible. As soon as we show up, we inspect the building and figure out how severe the problems got and where in your house suffered from moisture-related issues. We use moisture sensors and meters to determine how wet the carpet, drywall, and wooden materials got after the leak. Once we make sure the work area is safe and develop a plan of attack, we begin removing moisture. To start, our SERVPRO Franchise professionals utilize specialized extraction equipment to pull out water while it is liquid. After our extractors pull out as much liquid as they can, we commence the rapid structural drying phase. During this procedure, we set up air movers and dehumidifiers. Air movers push air around while the dehumidifiers remove moisture from the air. There are two different types of dehumidifiers we utilize; one works off of condensation while the other uses chemical attraction to remove water from the air. Desiccant dehumidifiers use a water-absorbing silica gel to pull out moisture. The machine pulls air across a desiccant wheel that pushes smaller amounts at a time across the silica gel that chemically attracts moisture particles. A heating coil inside the unit then heats the air dispersed around the wheel to help the water vapor removal process. The dehumidifiers then release hot, dry air into the affected environment. If you ever have your plumbing system fail and need specialized drying, call SERVPRO of Durham at (603) 868-3343 as soon as you notice you have a problem. Read about Kingston State Park here. 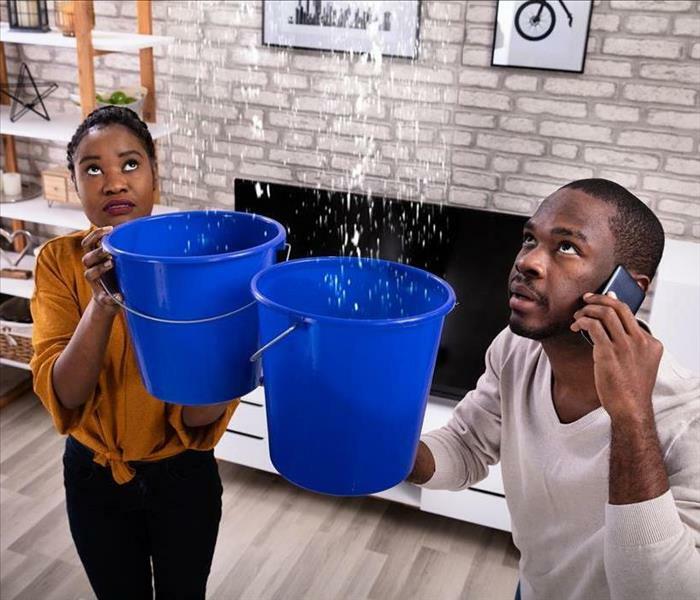 3/14/2019 - When Dealing With A Water Damage Disaster In Your Durham Home, Our Crew Is Here To Help! 2/14/2019 - What are Desiccant Dehumidifiers and How are They Used to Remediate Water Damage in Your Kingston Home?